← 2019 Victoria Flamenco Festival Dates! The Flamenco de la Isla Society is hosting a Flamenco Tablao featuring Victoria’s familia flamenca: Veronica Maguire, Gareth Owen and Denise Yeo, with invited guest cantaora (singer) and dancer, Stephanie Pedraza. Saturday, March 16, 2019. Doors open at 6:00 pm | Show at 7:30 pm. The Mint’s delicious food and drink will be available for purchase throughout the evening. Don’t be disappointed, buy your tickets early! The last 3 events sold out in advance with waitlists. Tickets are $28 for Flamenco de la Isla Members and $33 for non-members. …If still available, tickets at the door will be $35. 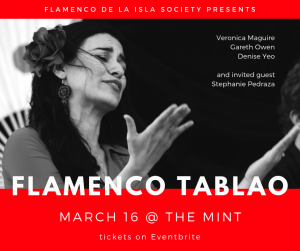 Flamenco tablao is an intimate performance where the artists collaborate without much rehearsal and rely upon connection, improvisation and traditional flamenco musical cues to accompany one another and express the aire of each piece (…atmosphere or feeling of each piece). Tablao is more formal than a juerga (think: kitchen party) and far less formal than theatre flamenco. Tablao is the result of bringing flamenco out of the home and presenting it for anyone to come and enjoy. Because the artists do not rehearse, the work is immediate, charged, and reflects the present moment.